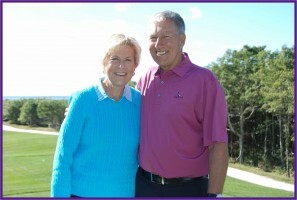 generous benefactors of the College, John ’69 and Cheryl Noblin ’71. The scholarship benefits an academically qualified and financially needy Stonehill College student majoring in neuroscience with an interest in researching ALS. The hope is to further the research to help find a cure for this disease while helping deserving students to pay for their education at Stonehill. "One of my proudest moments of my Stonehill career was my Neuroscience Capstone project. For this project, we were allowed to choose any topic of neuroscience and come up with a novel hypothesis on it. As I am incredibly interested in neurodegenerative diseases, I decided to do mine on Amyotrophic Lateral Sclerosis (ALS). Throughout this project, I was able to achieve a better understanding of not only the causes, symptoms, and complications of the disease, but also the underlying biological mechanisms that cause these symptoms and complications. Through reviewing the scientific literature and critically thinking about the disease, I was able to come up with a novel hypothesis for a potential treatment for the C9ORF72 mutation that causes some forms of ALS. to develop this idea into fruition and potentially help those with the disease. tremendous opportunities Stonehill has to offer."